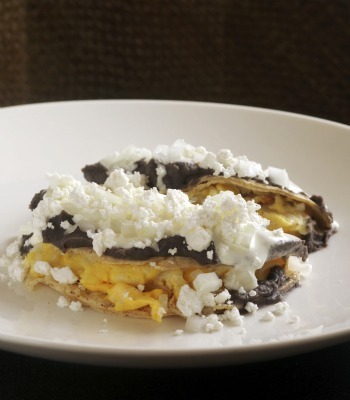 Ingredients: eggs (2), tortillas (2), refried beans, soured cream (50mL), fresh cheese. Instructions: In a pan, heat oil. In a small bowl, scramble eggs. Add milk if desired. In another pan, heat 2 tortillas. Tip into a plate when warmed. Tip the egg mixture into the pan with the oil, stirring until desired consistency is achieved. Add the eggs to the tortillas, folding the tortillas as shown in the picture. Add the refried beans, the soured cream and the cheese.